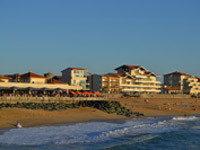 Campsite France Landes : Des vacances dans les Landes à Moliets-plage. Welcome to Le Saint Martin campsite. This exceptional 18-hectare site, right at the heart of the Forêt des Landes, literally dips its toes into the Atlantic Ocean. 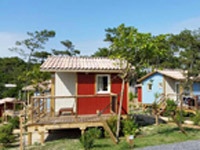 You are assured a very warm welcome at Le Saint Martin campsite in Moliets-plage. 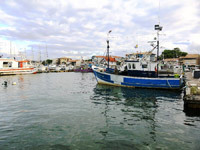 Open from Easter to the October/November holidays, it offers a friendly and homely environment. Why choose Le Saint Martin campsite? You will be rocked to sleep by the soft murmur of the waves and the Atlantic Ocean and will be able to rediscover the joy of a simple and peaceful life. The campsite offers direct access to Moliets beach. Direct access to the huge sandy beach, the magnificent Courant d’Huchet nature reserve, green routes and cycle tracks, as well as a number of on-site shops and restaurants, mean that, should you wish to, you can go everywhere on foot or by bike and enjoy a 100% natural stay. This unspoiled and protected environment is the perfect place to recharge your batteries and relax with family or friends in our high-quality rental accommodation (mobile homes, chalets, tents or log cabins with panoramic views) for 2 to 6 people. Or you may prefer to spend your holiday in your tent, caravan or motorhome on one of our 80-150 m2 camping pitches (with or without electricity). In and around our indoor, heated pool (charge payable in July and August) and 2 outdoor pools, which are open from June 15 to September 15 (see the water park photo gallery), the whole family can enjoy a dip in the pool or a spot of sunbathing. We offer free entertainment for all: a kids’ club, a teens’ club and a variety of fun sports activities for children and adults available throughout the day and in the evening (July and August only). The wide range of shops and restaurants in Le Saint Martin’s 2 on-site shopping areas can cater to your every need. The campsite reception is open daily from April 06 to October 13. From 9am - 7pm in low season. And from 9am-8pm in July and August.